What better and more exciting way to get off the beaten path and experience the incredible scenery and diverse culture that Viet Nam has to offer than on one of our modern mountain bikes? Together with our experienced guides you’ll ride through breathtaking mountain passes, visit markets in remote hill tribe villages, and interact with the locals as they indulge their curiosity in you and your cool bike. The trip starts from Sapa going uphill to the Silver Waterfall by a jeep. After the waterfall you will cycle up to Heavens Gate, the highest mountain pass in Vietnam. From here you can enjoy the stunning scenery across the valley. 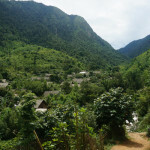 You will then travel by bicycle down to the Black Hmong village .If the weather is good you can enjoy a swim in the river, while your guide prepares lunch. This is a good time to take a walk around the nearby village and see how the locals live. After lunch, you will descend to Binh Lu. Upon arrival in Binh Lu you can visit the village inhabited by the Coin Dzao minority people. After a long day of activity and sightseeing you can now enjoy the trip home by jeep! 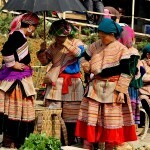 End trips in Sapa Town or extend to others. Tour to handy craft traditional village of 2 different minorities: the Red Dzao and the Black H’mong.